Tough. Durable. Quality. Bear Track aluminum trailers and ramps are designed and engineered to be the most dependable trailer on the market, ready to handle use from your toughest jobs. 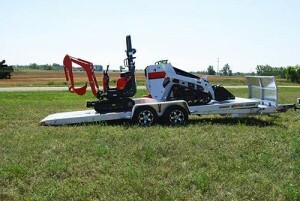 From small ski loaders to compact excavators, we’re your trailer solution for up to 6,500 lb. hauling capacity. Bear Track, a brand of Voyager Industries, Inc. manufactures a complete line-up of aluminum trailers and aluminum ramps, all covered by a 5-year structural warranty. Bear Track’s trailer line includes Utility, ATV/UTV, Motorcycle, Snowmobile, and Car Hauler Trailers. All trailers and loading ramps are sold through a network of knowledgeable and friendly dealers throughout the United States and Canada. Each of our dealers has the highest customer satisfaction in mind; contact one today to learn why a Bear Track Trailer should be your next trailer investment.